:) I found a really cute, fast and easy dishcloth pattern that I just HAD to make but I'm going to use it as a washcloth instead.. This lady designs some really cute ones! I have her Winter Set on my wishlist and hope to make those next. I finished this in 2 nights and I'm a beginner knitter! So if your so inclined, check out the Be My Dishcloth pattern there and be sure to check out all the other dishcloth designs in her series! Happy Knitting everyone! Model: My ironing board *LOL* Dont you love the paisley background design? In the new year i'm going to make as many snuggle blankets as I possibly can for the Snuggle's Project or Hugs For Homeless Animals for donation to my local animal shelter. These are super simple to make. Even if you are a beginner Crocheter or Knitter. They have a lot of different, easy patterns to choose from. So, if you have a spare moment, why not whip some of these up for donation? The animals will thank you! 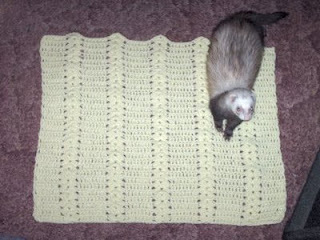 My Building Bridges Snuggle being tested by my Ferret, Bo. I was a secret Santa to Pound Cake the ferret this year. This was the first time I've ever been a Secret Santa to anyone and I enjoyed it so much. Im a really big animal lover and it breaks my heart to hear the sad stories of these ferrets, or any animals for that matter. So, as of today I decided to revist the Ferret Giving Tree and be a Secet Santa to two more ferrets! Their names are Roxy and Jupiter. I hope that all of these ferrets will get Secret Santa's and if they dont, I will be going back to the site even after Christmas to pick more if the Giving Tree is still up until all ferrets get something. So please, if you can and are able, I beg you to pick one of your own and be a Secret Santa to one of these loveable fuzz butts! 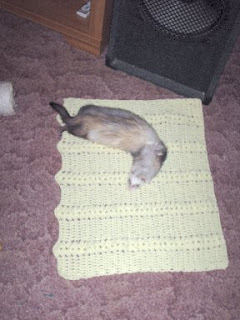 If you've never been around a ferret, or have never owned one, you dont know what your missing! They really are great pets and give you lots of love! So I leave you with some pics of Pound Cake that the shelter ferrents(parents) sent to me of the fuzzbutt nosing through the box of goodies that I sent her! 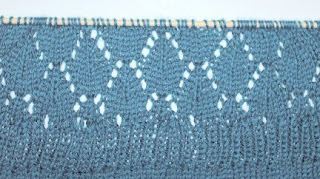 I think my most favorite thing about knitting is Cables! I love them. I love the intricate design they weave thru the yarn. Cables are what pushed me into learning to knit because I loved the designs so much. I do have to admit that I was terrified in learning them and they were really difficult for me at first, but I finally managed! 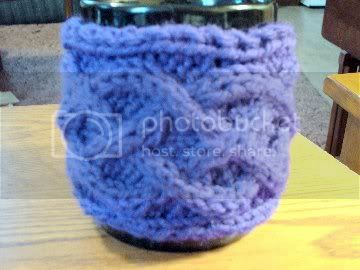 I was surfing around the other night and at the Vogue Knitting website and in their free patterns I found the Renaissance Cabled Mug Cozy (scroll to middle of page). 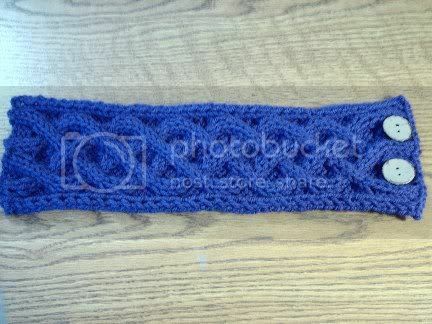 I figured this would be a quick knit for me and a beautiful cabled pattern to boot. Which it was/is! I decided to give this to my co-worker Jo for her oversized-10-gallon-keep-you-caffinated-all-day-coffee-mug. I opted to do buttons for the closure instead of using the string ties as the pattern called for. I remembered buying a pack of really cute buttons at the Dollar Tree sometime back and decided to dig them out and use them. I didnt have any purple thread to match the yarn, but used white instead. It doesnt look to horrid! You can barely tell it. I didnt create any button holes because the pattern had created a nice little place that you could slip the button thru to hold it together all by itself. Craft Time: 2 days cause I was lazy. Would have only taken a couple of hrs if I kept at it. Have I mentioned that I have no idea what i'm doing on this cardigan? *LOL* I should have chosen a slightly-less-intense-for-a-newbie project. Especially not lace I think. But anywho, here's the progress pics. 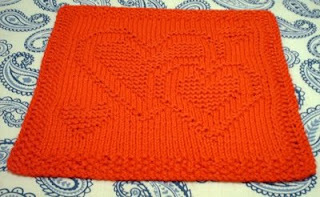 This month, I posted my very first Wishlist post in the RAK group on Ravelry. And today, I came home to a mailbox full of goodies from a fellow Raveler named Gayleed. I was tickled pink to receive all this goodness!! I'm so excited, I dont know what to use first! *LOL* I think if I ever get my Hey, Teach! 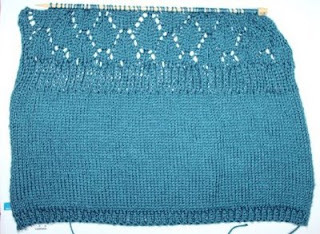 cardigan completed, I shall embark on learning the DPN's. I'm so scared to death of those things! It was hard enough for me learning to use 2 pointy sticks instead of 3 and 4 at a time! It makes my head spin! *LOL* And plus, I'm terrified of my work falling off one of the ends! I cringe at the thought of trying to put those crazy little stitches back onto the needle, which by the way, I ALWAYS put back on WRONG. *LOL* I'm still learning how to do that. Sometimes I do it right, but most times not. *sigh* oh well, its a learning experience. Here's a great tutorial for a Crochet Hook/Knitting Needle/DPN hook case made out of a recycled hardback book cover and scrap materials. Found here on Craftster. I'm definately gonna make me one too!